INEA Director Dirk Beckers and Goran Frančić, Director of LNG Croatia LLC signed today a grant agreement releasing €101.4 million of EU funding from the Connecting Europe Facility (CEF) to complete the construction of liquefied natural gas (LNG) terminal on the island of Krk in Croatia. 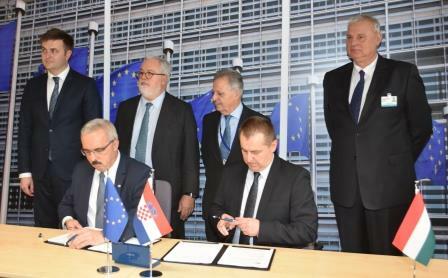 The signature ceremony took place in the margins of the Energy Council, in the presence of Miguel Arias Cañete, Commissioner for Climate Action and Energy, Tomislav Ćorić, Minister of Environment and Energy of Croatia and the Hungarian Minister of State András Aradszki. The new LNG terminal in Krk will secure energy needs and increase security of gas supply through the provision of new gas supply route for the Central and South Eastern EU countries. The construction of new terminal is an EU Project of Common Interest (PCI) for the building and operation of infrastructure for receiving, storing, reloading and regasification of LNG. Parts of this project - pre-investment stage, onshore and offshore studies and other multi-disciplinary studies - are co-financed by CEF Energy. The completion of these studies led to the next phase of the project which is the construction of the Floating Storage and Regasification Unit (FSRU) with yearly capacity of at least 2 billion cubic metres (bcm), a dedicated jetty and a connecting pipeline. The FSRU and the LNG terminal are expected to be fully operational by end of 2019. The Connecting Europe Facility in the field of energy provides funding to infrastructure projects in electricity, natural gas and smart grids with the aim to better interconnect energy networks towards a single energy market in Europe. The programme supports the key objectives of the Energy Union by promoting further integration of the internal energy market, enhancing security of energy supply and integrating energy from renewable sources into the network.